Since I was flying from Toronto to DrupalCon San Francisco 2010, the US passport control and customs were in the airport before flying. Her: "Passport and boarding pass please ..."
Her: "Where are you going?" Me: "San Francisco, for a conference"
Her: "What type of conference?" 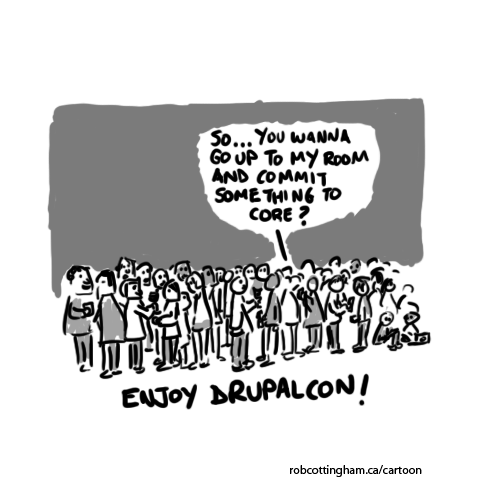 Me: "DrupalCon, it is web content management software"? University of Waterloo chooses Drupal! In 2008, the University of Waterloo formed a committee to select a web content management system. In March 2009, the selection was narrowed down to three CMS's, Drupal being the only Open Source one of them. The other two being RedDot by Open Text (a company headquarted locally in Waterloo), and Cascade Server by Hannon Hill. Later RedDot was selected as the CMS of choice. Read more about University of Waterloo chooses Drupal! Here is yet another example of Drupal being used as the basis of a custom "distro". Ubuntu now has UbuntuDrupal which is used for the LoCo's (Local Communities). Its original aim is to make Drupal easier to setup (which they describe as "painful") and run for these communities. They say that it has grown to be a "general development suite".